For those with moderate to severe facial lines and wrinkles, Restylane specially formulated two hyaluronic acid-based dermal fillers to provide exceptionally natural-looking rejuvenation. Restylane Refyne and Restylane Defyne were created using XpresHAn Technology to restore lost facial volume while maintaining flexibility to support natural movement. These fillers are designed to minimize laugh lines in a way that supports the patient’s natural expression. Restylane Refyne is often ideal for those who are unhappy with pronounced facial folds but want to retain optimal flexibility or stretchability of the lower face. Restylane Defyne is more appropriate for individuals who have deep facial lines and wrinkles, due to its ability to provide more advanced support. 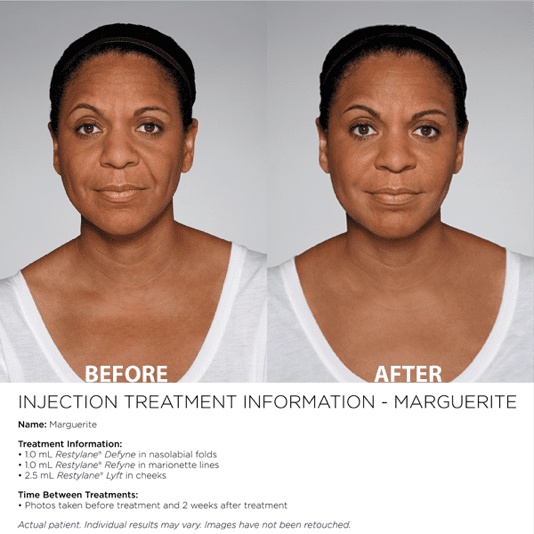 At Renew Aesthetic Clinic, our patients can effectively smooth common concerns like nasolabial folds and marionette lines by using one of Restylane’s innovative new injectable fillers. Both Restylane Refyne and Restylane Defyne are intended for patients who are 21 years or older. A typical injectable session lasts approximately 30 minutes to complete, and improvement usually take place immediately after treatment. Most patients do not require any downtime, allowing them to return to their normal routine after leaving our office. It is normal, however, to experience mild bruising, redness, or swelling at the injection site, but these side effects should quickly dissipate. Results from Restylane Refyne and Restylane Defyne have been shown to last up to 12 months, if not longer. Patients can choose to undergo touch-up treatments at our clinic to prolong their youthful appearance whenever they are ready.